Last year I had about 6 weeks to design my miniature setting, buy and keep alive the plants, create the miniatures , and, most importantly, submit an accurate and correctly named list of all the plants I used. Since this was my first time, I had no idea how to do this but I have studied botany, became a Master Gardener in New Mexico, and always labeled my plants with their proper Latin names. So I was prepared but this can be one of the most daunting parts of any entry in the Flower Show. Fortunately, I know how to design and use databases so I designed a very simple one to keep track of the plants I might use and to generate the plant list that has to be submitted. This is what an individual record looks like. 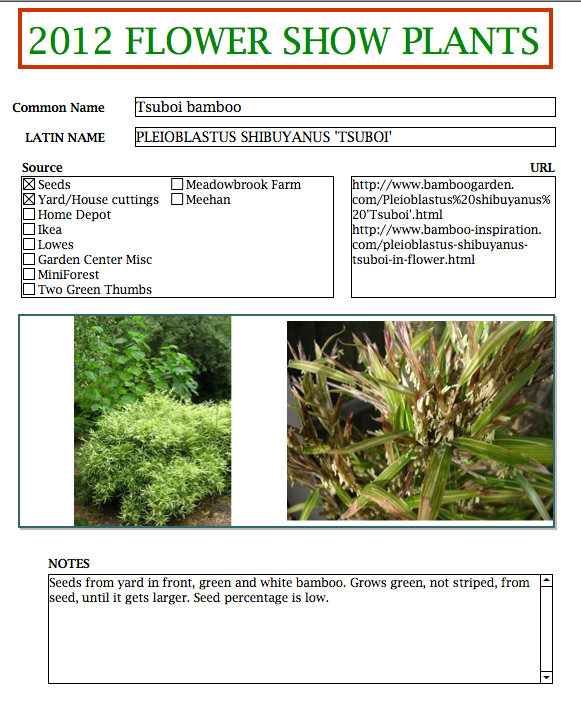 My database currently has 100 plants in it and I am starting to update it. The images are from the websites listed and not from my own garden, although I would like to add my own images.